Aerosols, namely particles with sizes from few nanometres to several microns suspended in a gas, are ubiquitous and constituents of atmosphere. Since 2005, in the Laser and Mass Spectrometry Laboratory of Istituto Motori, investigations on the new particles formation are carried out by monitoring the nucleation of vapours in laboratory experiments and by studying structures and energetics of clusters as possible seed of nucleation. 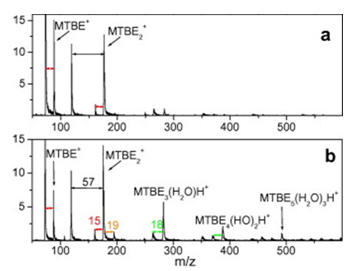 Time-of-Flight Mass Spectrometry (TOFMS), in combination with Molecular Beam (MB) and near-threshold tunable Single Photon ionisation (SPI), is the method used to study the clusters as precursors of aerosols. 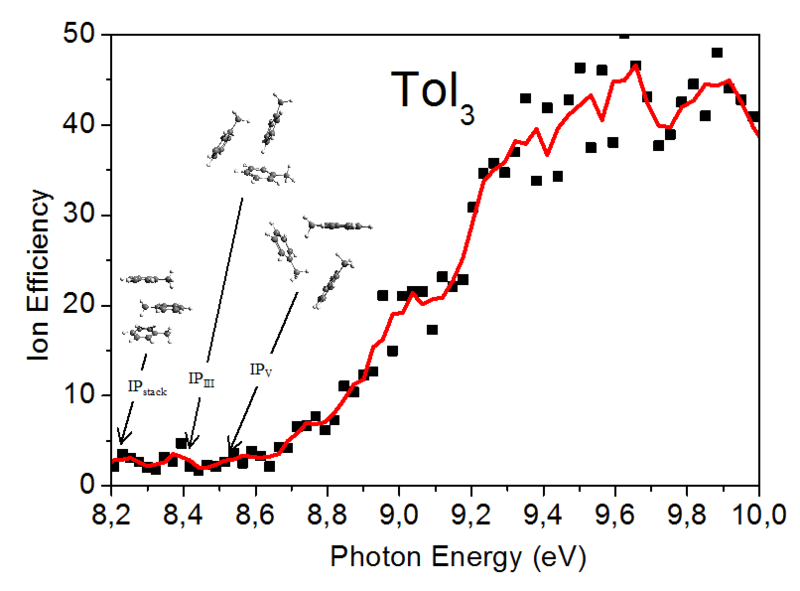 The main features of near-threshold ionization, with photon energy tunable in the 7-12 eV range, are a) the reduction of fragmentation of weakly bound molecular complexes, and b) the possibility of (selective) ionization spectroscopy. Van der Waals (vdW) organic molecules clusters or hydrogen bonded clusters (mainly hydrated clusters) are investigated with VUV photoionization spectroscopy. Quantum-mechanical modeling (Density Functional Theory or DFT) is carried out to investigate structures and energetics of clusters, as well as molecular dynamics mechanisms resulting from photoionization processes. Experiments on sodium-doped molecules are in progress, in order to realize aerosl sizer based on UV ionisation and mass spectrometry. The aim is to enhance the detection of aerosols and then to allow a focused study about the influence of antropogenic emissions on the aerosol formation in the atmosphere. 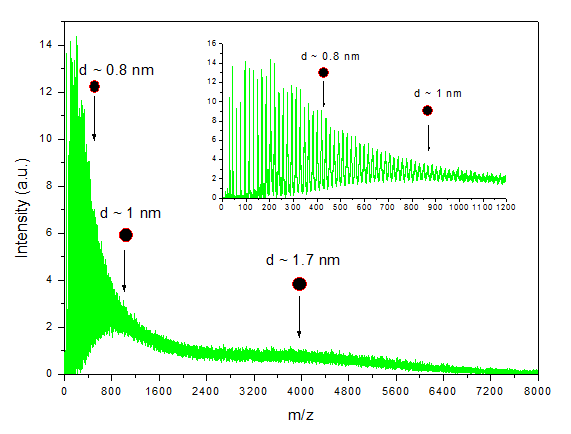 VUV-SPI photoionization of toluene clusters. From the comparison of Photoionization Efficiency (PIE) curves and DFT calculations on stacked and not-stacked cluster structures, it resulted that the most probable growth mechanism for toluene clustering involves the dimers as nucleation seed. Photoionization process in hydrated clusters. The addition of water to the cluster aggregation may have significant effects: the high stability series detected in the mass spectra of mixed ethers-H2O clusters results from multiple proton transfer mechanisms whereby, following the photoionization, the clusters rearrange by allowing a proton to migrate from ether molecules, and then to the water molecule, to which it bonds by forming a stable H3O+ core. Typical mass distribution of sodium-doped water clusters. 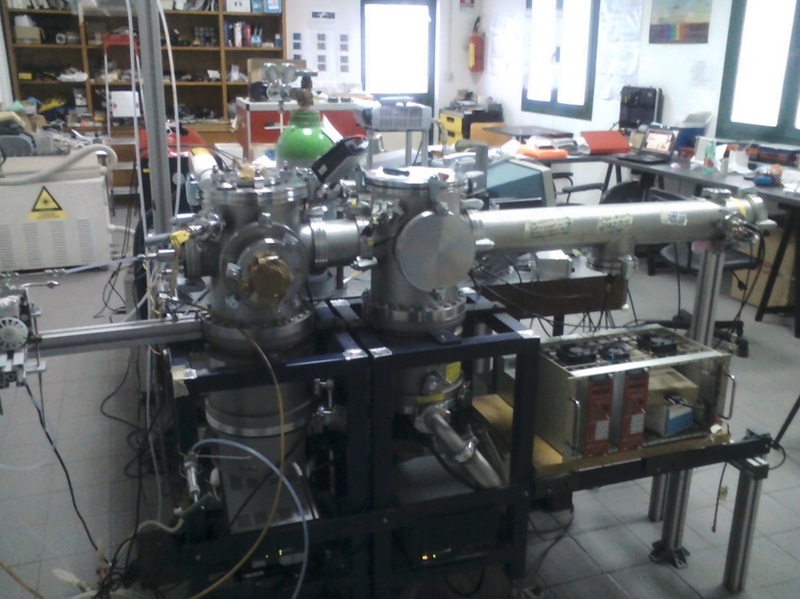 SPI/MB/TOFMS (Single Photon Ionization, Molecular Beam /Time of Flight Mass Spectrometer) experimental apparatus at laser and Mass Spectrometry Laboratory of Istituto Motori.